The week continues to be a barrage of unanticipated, shall we say "challenges." Little sleep meant I didn't get up for the 5am WOD (that's two missed sessions this week!). I went downstairs with plans to cook breakfast and prepare lunch. Alas, the coffee maker had exploded coffee and soggy grounds all over half the kitchen. It was e-v-e-r-y-w-h-e-r-e. Suffice it to say, cooking time became cleaning time. Luckily, my order from Paleo Brands had recently arrived so I grabbed one of their frozen entrees and headed off to work. 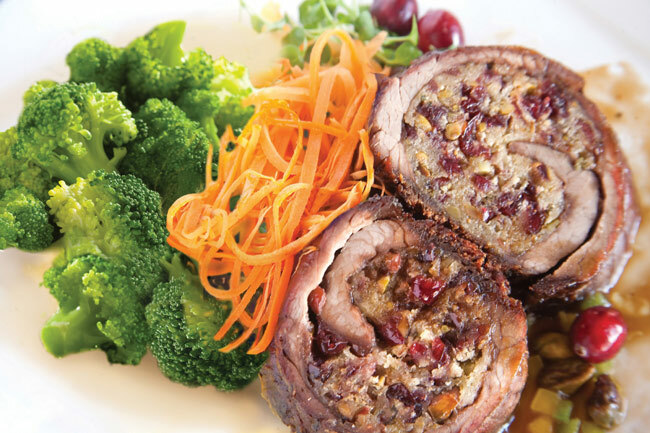 When lunch time came I opened my "Beef with Curry Pistachio Stuffing and Broccoli." First impression: this looks nothing like the photo. As you can see above it appears to be two sections of marinated beef filled with a robust stuffing of primarily pistachios and cranberries served alongside broccoli and carrot strings. There are no carrot strings, those were for aesthetics in the promo image, it seems. Ok, no big loss. The beef looked a bit sad. It was four very thin slices. The stuffing was a pale yellow, no cranberries in sight. It was sitting in what looked like a pool of gravy. I was dubious but continued on with warming the meal up in the microwave (was ready in about 3.5 minutes) and commencing consumption. Sorry to say it was a disappointment. The beef was very well done and commanded no real flavor. The same can be said of the stuffing. It was minced super fine and fell out of the beef roll-up as soon as you cut into it and would then wash away in the hefty amount of au jus. A slotted spoon would be needed to retrieve the finely minced filling from the unnecessarily deep juice pool. The ingredients list includes exciting elements like curry powder as well as those mythical cranberries but I tasted none of it. Couldn't even really pick up on the pistachio element either.The only accomplishment was a good portion of bright green broccoli and the fact that my hunger was appeased at meal's end. Much praise goes to the marketing department who hired the food photographer. It looks like a yummy meal. My hope when placing the order had been that I'd have a stash of truly healthy, well-prepared meals for when there was zero time for food prep. Honestly though, it would be worth it to spend a few dollars extra on a Panera salad or grab some fajitas at the local Mexican joint than to invest in this dish.